Here is an example of a shadow box frame we recently made for a customer named Diana. This project centered around some steamship inspection and engineering tools belonging to her father and grandfather. 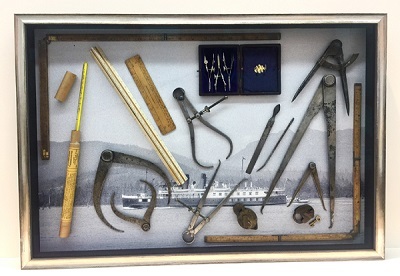 A collection of mariners and engineers tools mounted on a photo of the Lady Alexandra. The finished frame size of this piece is about 26 x 18-inches. According to her husband, Hugh, Diana’s grandfather worked as a steamship inspector for the British shipping company The Blue Funnel Line out of Liverpool. He was based in Hong Kong between about 1910 and 1927 to make sure the company ships were all in tip top condition. The rulers and some of the steel tools are from that era. While her father was an engineering student at UBC he had summer jobs with the Union Steamship Line that ran ships up and down the coast. He worked his way up the ranks starting as a deckhand. 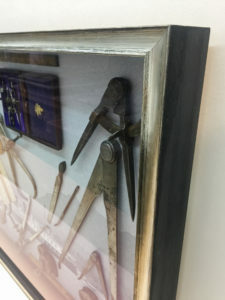 Many of his tools in this frame are drafting and drawing related; not necessarily related to shipping but the steamship work ties them all together. The ship in the photo is the Lady Alexandra somewhere along the coast in the early 1940s when her father worked as crew. We began this project with the photo which Diana and Hugh obtained from the Vancouver Archives. We mounted the photo on a thin sheet of mdf wood and then coated it with a UV resistant clear plastic laminate. This keeps the image flat and stable and reduces fading over time. It also gives us a strong enough surface to attach the items to. To frame these pieces we needed a frame that was deep enough to accommodate the thickness of the various objects. Working with the customer we chose a Larson-Juhl frame from their Spencer line. This frame has a bright silver leaf finish on the face and a rustic looking black outside edge. It’s about 1-3/4-inches, or about 4-1/2cm deep. This depth gave us the room needed for the backing, the photo on wood, the height of the tools, the glass and a little breathing room. Close-up of the Spencer frame from Larson-Juhl. 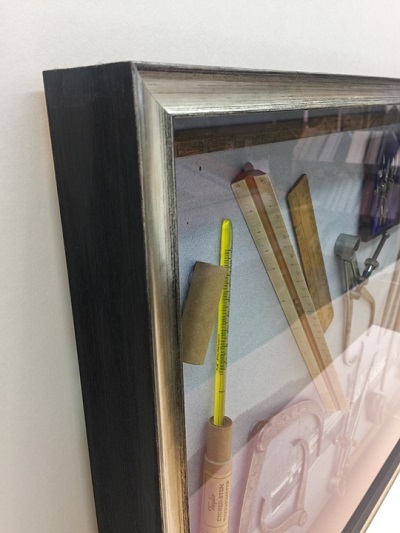 The main colours in the piece are various shades of blacks, whites and greys so the silver finish on the frame ties in with the photo and steel tools. The items were glued to the laminated photo with discreetly placed drops of clear silicone. Silicone has a good, strong grip and stays flexible over time so we often use that to hold objects in place. We also used some fishing line in a few places for added security on the heavier items. Items were secured to the backing with a combination of silicone and fishing line. For the finishing touch our customers chose Ultra Vue 70 glass to protect everything in the frame. Ultra Vue is the latest type of glass to come along in the picture framing industry. This glass is so clear it is almost invisible. It also reduces glare and blocks 70% of the incoming UV light so it will reduce fading of the artwork over time. Would you like more information? Please contact us at 604-738-0017 or email. One of our staff members will be happy to help you.